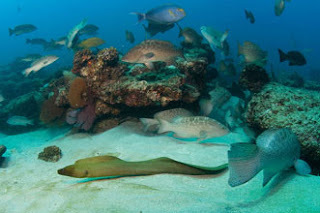 Cabo Pulmo Marine Reserve from Gulf Program on Vimeo. In the ten years studied, the researchers found that Cabo Pulmo's fish species richness blossomed into a biodiversity "hot spot." Animals such as tiger sharks, bull sharks and black tip reef sharks increased significantly. Scientists continue to find evidence that such top predators keep coral reefs healthy. Other large fish at Cabo Pulmo include gulf groupers, dog snappers and leopard groupers. In addition to Aburto-Oropeza, co-authors include Brad Erisman and Grantly Galland of Scripps Oceanography; Ismael Mascareñas-Osorio of Centro para la Biodiversidad Marina y la Conservación in La Paz, Mexico; Enric Sala of the National Geographic Society and Centre d'Estudis Avançats de Blanes in Spain; and Exequiel Ezcurra of UC-MEXUS at UC Riverside. The research was funded by the David and Lucile Packard Foundation, International Community Foundation, Moore Family Foundation, Pew Fellowship Program on Marine Conservation, Robins Family Foundation, The Tinker Foundation and the Walton Family Foundation.